Platz is a zabuton cushion store with handmade items that has operated for 100 years near Tenryuji Temple in Arashiyama, Kyoto. Many temples and restaurants in Japan use these cushions for comfort. Be sure to stop by to see these traditional goods. A zabuton is a Japanese cushion that provides comfort when sitting on tatami mat floors in Japanese-style rooms and has been used historically in Japan. Platz is a zabuton specialty store located in Arashiyama, Kyoto. With a wide range of designs, they make many versatile cushions that can be used on various occasions. Let's take a look at the unique and fun zabuton cushions they have! The exterior of Platz has a European appearance. Along with the traditional Japanese zabuton cushion, Platz also carries imported goods from Europe, which explain the outside display. Once you step into the shop, you will be greeted with an otherworldly feeling. Platz first opened its doors in 1887. It was originally located in Nishijin in Kyoto, but when the cushion factory moved, the store relocated to Arashiyama. The Platz brand officially started in 1990, and have specialized in selling every-day use products ever since. They are most proud of their handmade zabuton cushions, which they have been selling for over 100 years. Zabuton is a traditional Japanese cushion that is made using folded cotton inside fabric. In Japan, zabuton are often used in temples or rooms with a tatami mat. At the Arashiyama factory of Platz, professional craftspeople fold the cotton, and with their refined skills, they carefully put the cotton into the fabric. The craftsmen make the process look very easy, but if you look at their hands, you can see how much strength is required in order to stuff the thick layers of cotton into the fabric. After the layers of cotton are placed in the fabric, they tightly stitch it shut. Once they add the decorations, the zabuton cushion is ready to be used in temples and Japanese restaurants. The zabuton cushions at Platz are not just traditional Japanese style. There are plenty of colorful and stylish cushions with cute embroidery that comes in different sizes. One unique product is a triangular pillow (shown above). The slope created by the triangle shape supports your shoulder and your head when lying down. Unlike a standard pillow, you can lean back and relax your head. The fan zabuton cushion is separated into three parts that support your bottom and legs when sitting. It will likely feel more comfortable than the standard zabuton cushion. 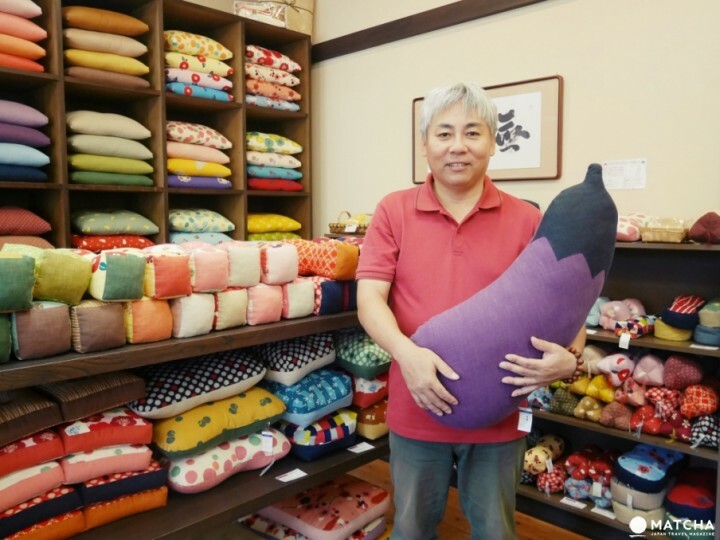 There are adorable pillows you can hug that are made in the shape of Kyoto's heirloom vegetables. These large veggies are also ideal for leaning up against. Small pillows like the carrot shown above can be used as a hand rest. This is a great choice for anyone who uses the computer at an office workplace. The ergonomic zabuton are especially recommended, designed based on data and science. This cushion will support the lower half of your body and your back. There are small pieces of plastic inside the zabuton cushion that shift and fit to match the body type of the person sitting down. You can purchase the cushions individually and combine various designs of your preference to make your own combination! In the shop, there are also mini zabuton cushions that are very popular. You can place your smartphone on it or use it for decoration. Platz carries hand towels and pouch wallets as well. At Platz you can modify the zabuton cushions. Select a design and the shape of your choice and the craftsmen will make a personalized cushion just for you. Please note that it will take some time for customization so if you are interested, it is advised to order it online prior to visiting. Find Your Zabuton and Chat with the Manager! The manager at Platz can also speak Chinese and has many friends and connections in Taiwan. If you want to learn more about his story, why not visit Platz in Arashiyama to talk with him and select your own zabuton cushion? This article has been translated from traditional Chinese and has been edited. Shopping At A Shotengai - Enjoy Local Food And Looking For Souvenirs! Hakutoya - A Romantic Miscellaneous Goods Shop In Sasayama!